SIUE senior golfer Danny Gorman has been recognized for his achievement in the classroom and on the course. He was named to the Srixon/Cleveland Golf All-America Scholar Team by the Golf Coaches Association of America (GCAA). A business major, Gorman is one of just 260 Division I golfers chosen and is the third Cougar in the Division I era to earn the award. He joins Taylor Cox and Taylor White, who were honored following the 2013-14 season. On the course, the Rockford native enjoyed a career-year as a junior in 2016-17. Gorman appeared in all 11 of SIUE’s tournaments and finished with a career-best stroke average of 75.42. He earned his first top-five finish, taking home fourth place at Missouri State’s Twin Oaks Intercollegiate. 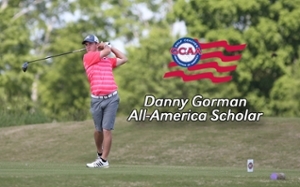 In the classroom, Gorman earned a 3.286 grade point average. To be eligible for Srixon/Cleveland Golf All-America Scholar status, an individual must be a junior or senior academically, compete in at least three full years at the collegiate level, participate in 50 percent of his team’s competitive rounds and have a stroke-average under 76.0 in Division I.